What makes it special: The SRT Demon is a more powerful wide body version of the Challenger. It debuted during the New York Auto Show in April 2017. The Demon uses an all-new 6.2-liter V8 engine equipped with a 2.7-liter supercharger, which puts out 808 hp with 91 octane gasoline and 840 hp with 100 octane fuel or higher, both outputs are with the red key. Torque stands at 770 lb⋅ft on 100 octane fuel. The car weighs 215 lbs. 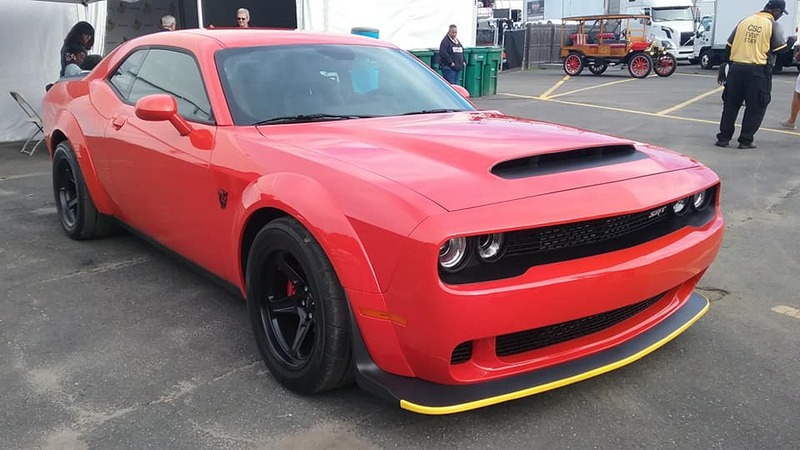 less than the Hellcat, the total being 4,254 lbs. The car uses road tires by Nitto Tire, called the NT05R. The tires are the 315/40R18 variations at both front and rear. The tires are targeted for the drag strip, but have enough footprint to make it legal for the road. This tire is a variation built specifically to withstand the power output of the Demon. This makes the Challenger SRT Demon the first production car to contain a set of drag radial road tires. The SRT Demon contains a trans-brake, which puts the transmission in 1st gear and the reverse gear simultaneously, holding the Demon stationary. This is used along with the car’s torque converter to build up hydraulic pressure before launch. The power-to-weight ratio of the SRT Demon is 418 hp per ton on 91 octane gasoline and 435 hp per ton on 100 octane or higher. Why I would want one: It’s the fastest, it’s the first, and can do a wheelie right off the showroom floor. If that’s not reason enough, how about only a certain number were ever made? Fun fact: Because of the lack of an NHRA certified roll cage, which is required if the quarter mile time is under 10 seconds, the NHRA banned the Demon from competition.